RAVATHERM XPS 300 WB is a closed-cell polystyrol foam thermal insulation material with factory roughened surface and plaster-carrying. Typical area of application is on building parts where the requirements are effective thermal insulation, high mechanical strength and thermal insulation capability maintained in wet environments, too. 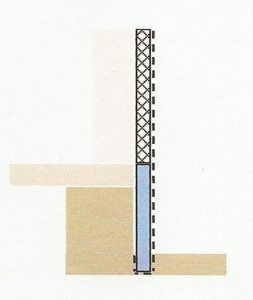 Due to its positive features and excellent technical performance, the roughened-surface RAVATHERM XPS 300 WB thermal insulation’s most frequent fields of application are building socles (under ground level, too), at terrace and balcony joints, and they are designed for/installed as so-called permanent boardings, for auxiliary/prefix thermal insulation purposes, in ceilings, concrete crowns and facade surfaces of pillar frames. – the expected behaviour and performance data of the product. Distinction must be made between a post-installation thermal insulation and an application on new buildings. There is rarely any water insulation on the socles of existing buildings, and the new building socles are generally subject to construction moisture. In case of a reconstruction, the quality of the surface to be insulated shall be assessed (raw or plastered) and the extent of moisture. If the socle is permanently wet, or has returning moisture, its insulation is not recommended, but dryer or moisture regulator plaster shall be applied to the lower 30cm instead. The RAVATHERM XPS 300 WB WBthermalinsulation shall be installed above this zone only. Decision must be made also about whether the thermal insulation can be installed directly on the socle or it needs preparation. In case of a new building, too, the adhesion surface must be taken care of. If the thermal insulation panels must be glued to the water insulation, the type of adhesive must be selected accordingly (e.g. bitumen-based, water-based or not swelling type, polyurethane adhesive foam, etc.) and in this case, auxiliary mechanical fixing cannot be made, either. The carrier base shall always be dry, solid, dirt-free, appropriately even shaped, frostfree, with appropriate load capacity and maintaining its shape. The application of the thermal insulation must always be started up so that the lower edge of the sheet is protected, with a metal starter profile or so-called sub-surface mesh, when the reinforcement glass fiber mesh is adhered to the carrier base e.g. the wall first (in a width of min. 10cm), then the thermal insulation is applied, the embedded glass fiber mesh shall be folded up and turned over to the outer side of the thermal insulation, to the front, so that the surface is continuous (with a min. of 10cm overlaps). a. If the soclethermal insulation starts up from the pavement, from the terrain adjacent to the building or a terrace joint, then the glass fiber mesh band shall be embedded on the wall into the product’s adhesive up to a height of 10cm, onto the carrier surface. The RAVATHERM XPS 300 WB closed-cell thermal insulation panels must be used up to a height of min. 30cm or up to the height of the floor, and it must be installed with a standard edge+point adhesion method so that the mesh starting up from the bottom is embedded also on the bottom edge of the panel. b. If the socle thermal insulation starts under the pavement or the ground level, the undermeshing shall still be performed. In this case, too, only closed-cell polystyrol foam thermal insulation panels must be installed up to a min. +30cm above the final pavement or ground level. The covering plaster of the the appropriately coarse soclethermal insulation shall reach min. 10 cm under the final pavement or ground level! c. If there is no reason for, or is not recommended to start the closed-cell polystyrol foam thermal insulation from the pavement or ground level (e.g. for architectural considerations, or if a drying surface must be provided for the socle in the zone under the thermal insulation that regularly receives moisture. Adhesion to moisture-taking surfaces shall take place with TICS (Thermal Insulation Composite System) adhesive, and using auxiliary mechanical fixing – dowelling – is always mandatory! PUR adhesive foam or bitumen emulsion adhesive shall be used for non-moisture taking bases (bitumen sheet, pasted insulation, construction sheet) – without auxiliary mechanical fixing in case of water insulation. Adhesion shall generally take place using the edge+point method, and the distributed adhesive shall cover the thermal insulation panel in at least 40%. The PUR adhesive foam shall be applied within the edge adhesion zone in W, M or X shape, or possibly in stripes, in a quantity so that after squeezing 40% coverage is achieved. In case of double-layer thermal insulation, it is recommended to use the edge+point method for the glueing of the lower layer, and for the second layer installed with shifting the joint gaps, it is recommended to use the PUR foam according to the above description. In case of a coated soclethermal insulation, dowelling shall be performed through the reinforcement mesh crust, using steel hammer-in nail (or screw) dowels in every case. The recommended number of dowels depending on the weight of the coating: ≤ 15 kg/m2 3 pcs, 15-40 kg/m2 4-8 pcs (for each dowel shaft max. 8 kg vertical coating load recommended to be taken into account). Up to a coating weight of 15 kg/m2 it is sufficient to embed one layer of glass fiber mesh in a standard way, and then dowelling through that. In case of a coating weight of 15 – 40 kg/m2, two layers of glass fiber mesh dowelled through the first layer, or steel mesh, above that it is required in every case to embed a steel mesh and dowel through the mesh. The dowelling takes up the stresses originating from the heat movements caused by the temperature fluctuations up to the point of the adhesive setting. In case of a water-insulated socle, it is always necessary to adhere to the designer’s instructions! During the implementation of the thermal insulation system, continuous protection from frost and direct sun shall be provided. If it is known beforehand that the crusting of the thermal insulation will only take place after several weeks (or months), then a min. 1mm thick protective layer shall be formed using the plastering system’s adhesive on the surface of the XPS thermal insulation. If the installation of the coating layer is delayed until the winter-time frosts, then it is recommended to coat the protective layer with the primer of the system. The continuity of the reinforcement mesh installed on the thermal insulation shall be ensured using a min. 10cm overlap joint. 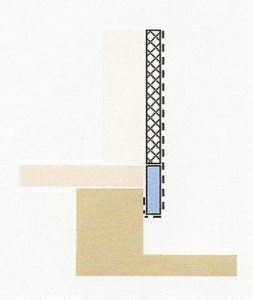 If the external planes of the soclethermal insulation and the building facade thermal insulation are identical, the reinforcement layer shall be installed with continuous meshing. 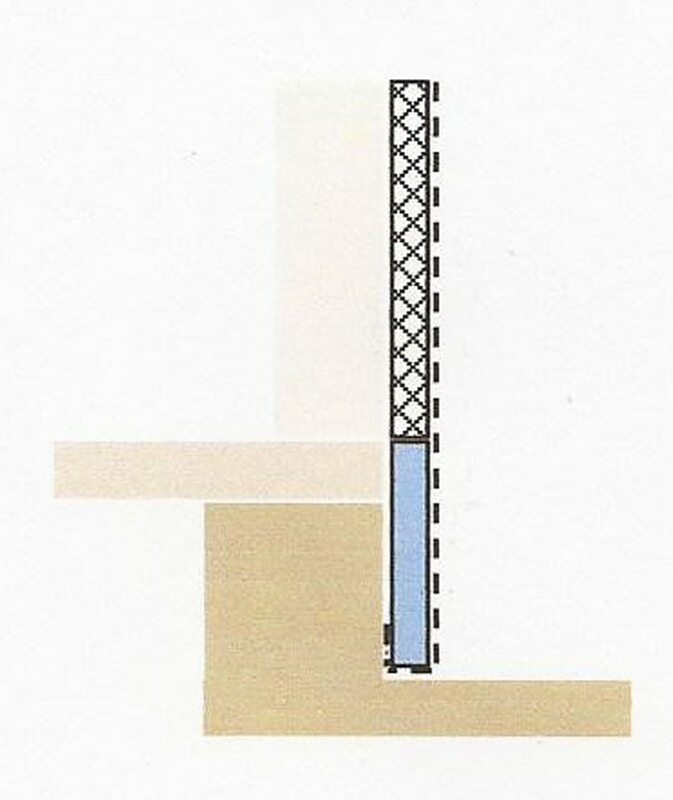 In these cases, it is unnecessary and unreasonable to install the steel starter profile under the facade’s Thermal Insulation Composite System that would otherwise form a line heat bridge. If the plane of the facade’s Thermal Insulation Composite System is lower than the socle’s, then the reinforcement glass fibre mesh shall be led through the plane step embedded in a standard way. In these cases, it is also unnecessary and unreasonable to install a steel start profile under the facade’s Thermal Insulation Composite System. The professional solution is to use a drip edge profile on the protruding edge, apart from the continuous surface meshing, to control the drain of the precipitation flow. The first stage of the standard embedding of the mesh is the application of the system adhesive on the properly fixed thermal insulation panels. The glass fiber mesh shall be pressed into the min. 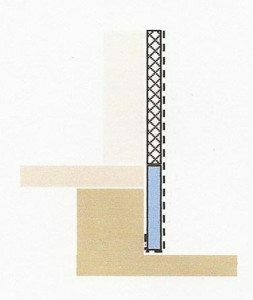 3mm thick adhesive by hanging-in, and meshing without waves or settling shall be completed using material pressed through the meshing from the plaster. For overlaps, the “fresh upon fresh” principle shall be used so that the adhesive thickness ensures the embedding of the two layers of mesh, and that the surface is in plane and no visible ribs are created. 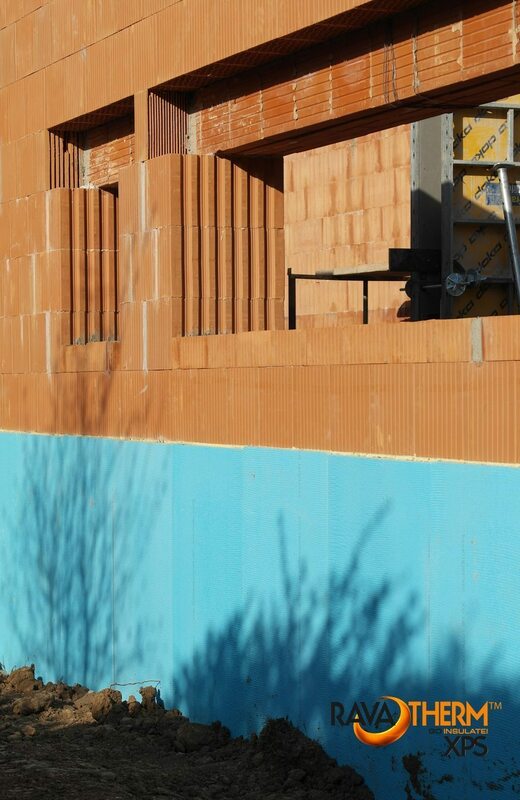 The surface finish of the socle’s Thermal Insulation Composite System is completed identically to the facade’s finish. 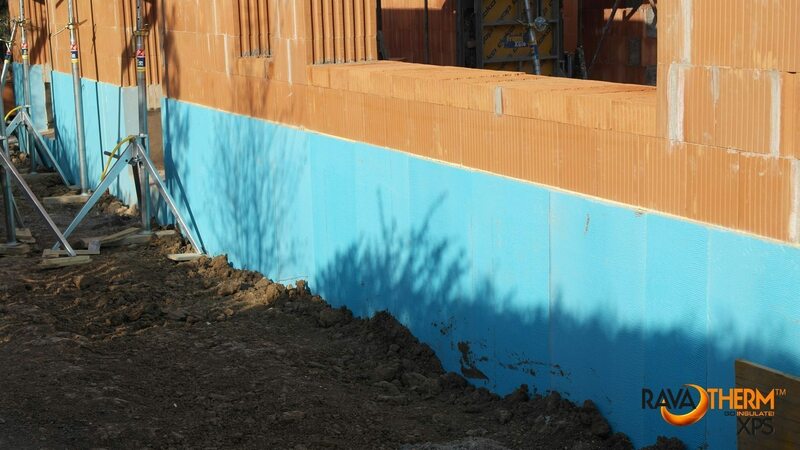 The base layer with reinforcement mesh shall be ground, cleaned after its drying and setting – after a technological delay specified by the manufacturer, as required – and shall be coated with the primer of the finish plaster. After the required drying of the primer (min. A new machine was added to our production line! 8184 Balatonfűzfő, Almádi út 4. ™ Trademark of Ravago S.A.